2013-14 Upper Deck Trilogy Hockey sees the brand return after a three-year absence. But this isn't the same Trilogy as the last one that was released in 2009-10. The new high-end configuration centers on autographs and only the top rookies available for the set. Every 2013-14 Upper Deck Trilogy Hockey hobby box comes with three mini boxes. Each mini box comes with three packs. The hits in every mini box break down to a pair of autographs and either a memorabilia card or a new UD Crystal card, making Trilogy a hit-per-pack product. A precursor to the double rookie class that will headline sets released after the start of the 2013-14 season, Trilogy focuses on the best players to debut during the shortened 2012-13 season. 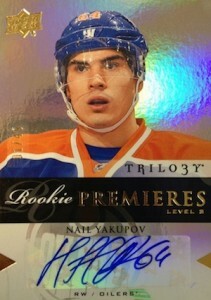 Nail Yakupov, Vladimir Tarasenko, Alex Galchenyuk and Jonathan Huberdeau are among the rookie cards in 2013-14 Upper Deck Trilogy Hockey. Just 33 rookies make the cut in the release, helping ensure a stronger upside. 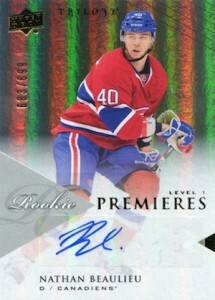 Rookie Signature Premieres have three levels for each player. Inserted one per mini box, they're numbered to 699, 399 and 49. Triple rookie autographs are numbered to 25. Signature Pucks use a puck face as the signing surface. 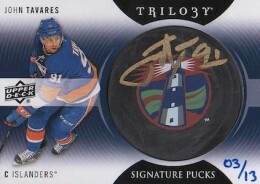 Besides basic versions, Trilogy also has rare Retro Logo (#/13) and Shield Logo (#/3) cards. Combining to fall one per box are Ice Scripts and Clear Cut Combos. Printed on plexiglass, it gives the signatures a distinct look. 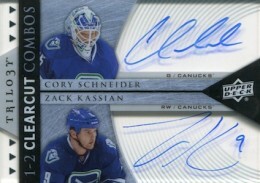 Past Ice Scripts cards have held up extremely well on the secondary market. Clear Cut Combos come with a pair of autographs in three levels of rarity. Bringing more of the plexiglass are UD Crystal. Inserted one per box, these high-end inserts come in three tiers each of active, retired and rookie players. 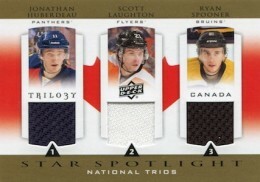 Rounding out the 2013-14 Upper Deck Trilogy Hockey hits are Three Star Spotlight triple jersey cards. Past, Present & Future offer a generational look at the game. There are also National Trios cards. 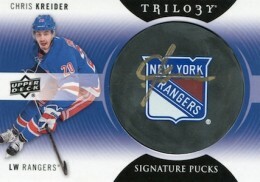 The 2013-14 Upper Deck Trilogy Hockey base set has 100 cards. 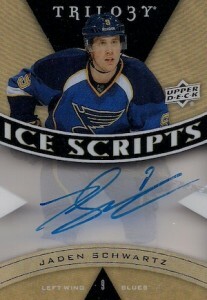 The Ice Scripts and Crystals are nice looking cards but the overall value of this product is horrible. Sticker autos on a strong rookie class for a $250+ product is embarrassing. 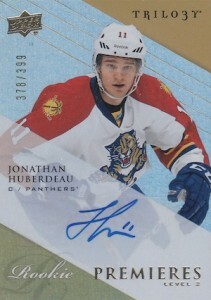 Furthermore, the triple jersey cards are poorly designed and should barely be considered a “hit”. 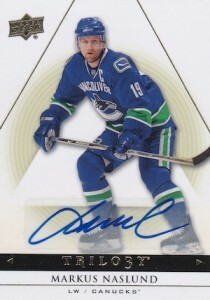 The puck signatures look like a “Sweet Shot” knockoff. For a “high end” product you are not getting your money’s worth. 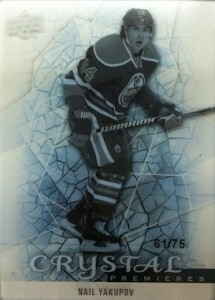 Yep – looks like a jumble of SPGU (base design, sticker autos), Ice (acetate), and Sweet Shot (pucks). UD should have just brought back Ice. Still, people will buy it. Rookies totalling 1150 per player at this price point is a serious embarassment. 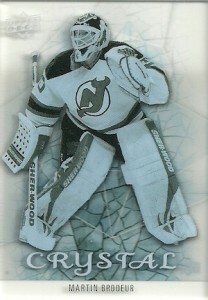 will sell but not because people know any better… need their hockey card fill after what happened last year. When I see a product like this for the price they are asking. 1.5 years into my venture back with this hobby is quickly coming to an end. the puck auto’s and the ice scripts are nice, but the pricepoint for this product kills it, especially with stick auto’s for the rookies. I’m sorry but if I’m going to pay over $250 even $200 for this product I do not want to see guys like josh gorges and Lars Eller in the checklist. I will pass. Sticker autos 3 levels totalling over 1000 rookie autos , garbage. Who are you kidding upper deck. Like the others say – what is UD thinking? Stickers on the first product of the year and a very high end product at that. After a long wait for the high end rookies from last year this is what UD responds with. Could you imagine how this product would do with hard signed autos? And once more we are seeing redemptions. If you are looking for value – this is not the product. Shame on you UD. When will they learn. Come to think of it after a case break it was pretty brutal to the eyes and pocket book. I bought 2 single packs and got a puck and a crystal, which I am aware is very good luck for the box…. I personally like the pucks hard signed maybe they are like the sweet shots but the pucks are the only value I see in this product ….don’t get me wrong I am not too happy with this product from the breaks that I have seen I mean 250 bucks for a box and not a chance at a patch card is garbage!!!!! NOT WORTH THE MONEY! no rc’s other than sticker auto’s of 1,150 per player, making value low.no base parallels other than printing plates. no patch cards of any kind. only on card auto’s aren’t numbered. product seems very rushed and poorly planed out. will not buy this product again. if anyone plans on Bying , wait. price is surely to come down, way over priced. what is it with collectors today, all it seems is everyone wants best for nothing….. this is a great product!!! 6 autos a box and tons of short prints, fyi you need to complain to the NHLPA if you don’t redemptions $250.00 is a reasonable price,as for sticker auto’s? really come on guys how many products don’t have sticker auto’s. except for super premium even SPA oes for anything over 3 autos it keeps the condition high and imagine how many more redemptions there would be. J.B I think what you are missing that everyone is saying is, look at the product that you compared this one to, SPA is 100 a box not 250 if this product was at that price point there wouldn’t be as many complaints. also SPA comes with 18 packs compared to 9 And more than double the price. I gave this product 3 stars because I think if the price point drops to 100 it would be a solid product. At the price point it’s at now it is held to higher expectations and in this collector’s opinion fell short of meeting the standards of the high end products out there. if you want to compare lets take a look at rookie anthology…. 100 bucks for 50 cards compared to 250 for 45, RA gives the chance and multiple patch cards they look great with hard signed cards which makes the redemptions understandable! Even SPX is a great product at a lower price point. Look, i’ve seen a few valid points both ways. First, as far as sticker auto’s go, who cares, it’s still the players hand signed autograph no matter how you dice it up. i pulled a signature sensation crosby from 10-11 upperdeck, and i wasn’t complaining when i got 3 Bills for it.i think the ice crystal rookies are nice #’/75. I mean those shoud be close to the value of ice premiere rookies especially where their that short-printed. The signature pucks are very cool,It’s nice to see guys like Ranford and old vintage players like Bobby Hull and Bobby orr, they look cool. I don’t lioke the 3 levels of rookies though, You always run into the whole “well the /699 is the real rookie and the /399,.49 aren’t really the players rookie, IE: the cup rainbows, How are these cards not rookie cards when they come out of the same product?? makes NO SENSE at all there!! I rated the product as being average only because there is only 9 packs per box. 15 packs would have made it much more worthwhile. I did do fairly well with my hits. A Ray Bourque autograph & An Etem RC #/49. 1 small error in the set is having the rookies #/699, /399 & /49. If a RC is #/49, don’t have the same player #/699 & #/399 as well. Makes no sense. My main problem doesn’t have to do with the product itself but, with the people who pull tough hits then, sell them for low, low prices. Ruins it for everyone! Takes the value way down. I have a Rookie Anthology Mayer RC/patch/auto #/99. Some sell them online for $12! What?? Ridiculous! Even selling the RC Silhouettes is getting tougher. Ok- said my peace. lol Cheers, all! I think this product is a great product, but WAY to overpriced. I have seen breaks, and I love the product, but once again, not worth the money. I recent bought a Granlund rookie auto for $7.50 on ebay. Granlund is one of the top rookies, and he is going for $7.50! I also just ripped open my first pack of that stuff today, and I pulled a Brendan Gallagher Signature Pucks, so I was very pleased with that. This is a product to buy occasionally by the pack, not the box. overall i buy lots of ice script and im ok with it !! Overall, I have had great luck with this product. I have paid 210 for it and each time I walk away with over 500 in value. I just cracked a case yesterday and got card 200 (yakopov/tarasenk/galchenyuk) what a great find … 2nd highest priced card. The design is crisp and clean for once. I really enjoy this product. I enjoy all the signatures even if they are on a sticker. In my early years you had to go to a game and wish that you meet a player to get a signature. So Im liking what I see. The cost doesnt bother me. In the end because of all the rookies for this year … this product will be worth more on the market in years to come. Some people need to be able to see the future projection of cards. Im not in it for the financial gain … im in it for the fun. Busting open a pack and seeing who you can get … still is the highlight of my day. Card collectors are too worried about the all mighty dollar and current value. I remember getting a gretzsky rookie in a pack that I paid under $2 for …. Its made money over the years and well worth it now. I hope that people dont move away from the enjoyment of collecting and the mysterious unkown that hides behind every pack. My collection to me is priceless because it has been the thing that has brought me and my son together with a common ground. As a teacher … I bring my collection in and share it with my students especially my hockey buffs. I believe that my views will be the ones that are longer lasting than anyone who complains here. Overall … go back to the old beliefs and collect to have fun … money is not everything in this world … you too will find that out … someday! Great card design. Lots of rookie autos. Question: What is the best One Touch size for the Signature Rookie Premieres? Is it 75pt? I need a bunch but don’t want to order too tight or too loose. Thanks in advance! On the second tab, there is a guide for determining the correct case size by using the thickness in base cards. Pretty good value in box especially given the variety of cards per box. I especially enjoyed the chase for the different rookies at each level. The signature pucks and crystals were also fun. Also, agree with prior statements that base cards seem like SPGU and triple jersey relics didnt do anything for me. Overall, good product with decent value compared to some panini products (playbook or prime). how much would the ccc-go gretzky/orr combo be worth? 2013-14 Upper Deck Trilogy Hockey HOBBY Box 3 Rookie Auto, Patch Jersey? 2013-14 UD Trilogy Factory Sealed Hockey Hobby Box -Nathan MacKinnon AUTO RC ?